Anti-Aliasing is broken by the "fboenable" option. It has been posted before that since the late developments of 1.7, Anti-Aliasing on Nvidia cards, and some AMD cards is broken. 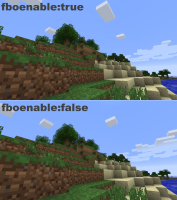 The only fix available currently is to go to Minecraft's "options.txt" and set "fboenable:" from true, to false. This allows AA to work however, super secret settings will just make a black screen, and enchanted items and potions will take up a whole inventory slot with their magic effect.